What do we (JLog) get from KK3Pro? Data integrity ESC–>JLog is guaranteed by use of a CRC 16-bit check sum. Only every 300 milliseconds we get an update. All data items are logged in OpenFormat, including alarms, if JLog is enabled for that. Optionally one may use self-made alarm devices controlled through alarm lines definable at JLog. Our connector at the ESC is of the shape of “Micro B USB” - but this is not USB! 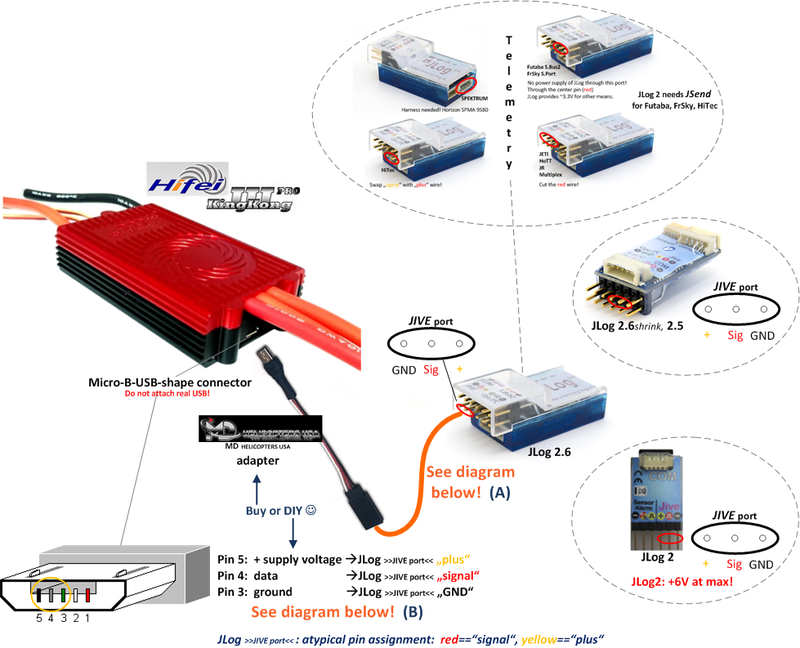 We need ground (pin 3) and “signal” (pin 4) and get also supply voltage (pin 5), simply because it is offered by ESC - and because the relevant connector at JLog has supply voltage input. So we need an adapter.. MD Helicopters offers an adapter (A) but they probably provide only buyers of a KK3Pro with that (just ask). This adapter supplies JLog from ESC. A servo patch cable has to be modified to swap red and yellow. 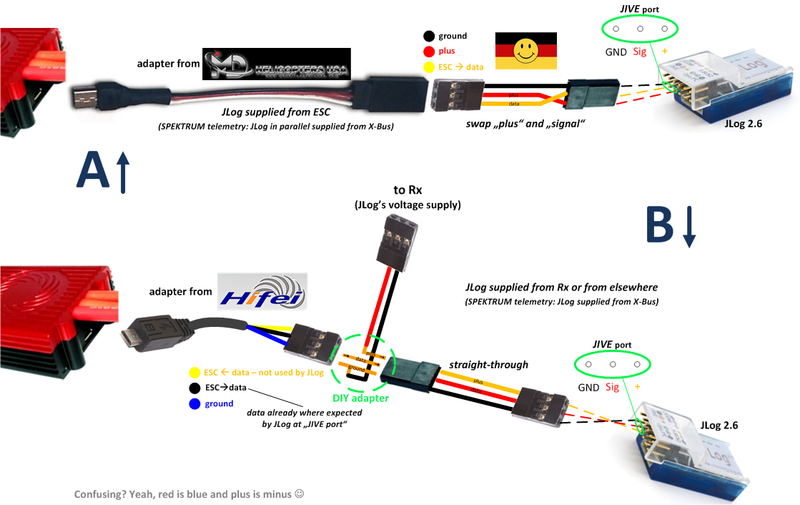 – Alternatively we use Hifei’s harness (for setup by PC program) with a DIY adapter (B). Note that we have an atypical pin assignment at JLog’s JIVE Port which is used to connect to KK3Pro: wires for “signal” and “plus” are swapped, – center pin is “signal”, +supply voltage goes to inner pin which normally is “yellow”. Ground is always at the outer edge. 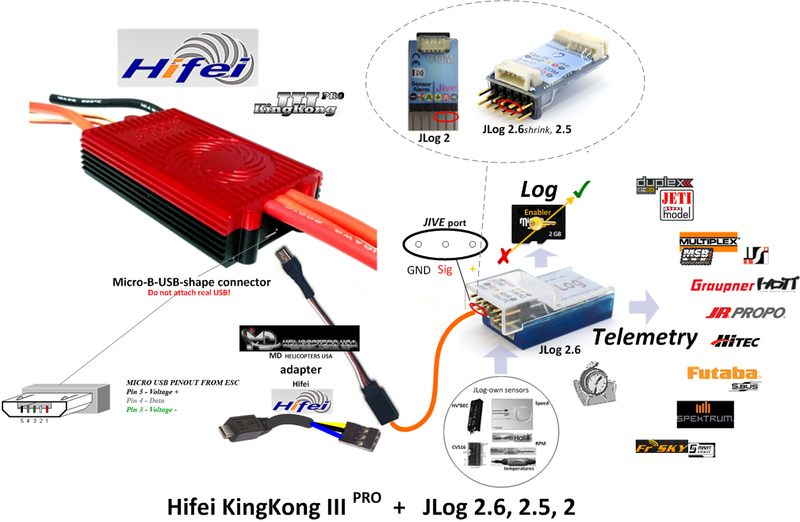 JLog voltage supply by ESC: Hifei specifies ~5..7V@200mA+ (now modified to 6 volts for any purchase order after Oct 20). JLog itself is a low-power device but can supply other devices through its data bus (JLog2.6 only), namely CVS16. CVS16 draws 80..100 mA on average. In case the telemetry is SPEKTRUM, JLog is supplied through its X-Bus connector from a TM1000. This is R/C raw voltage capable of higher load. – Overall: voltage from ESC should be adequate even for JLog+CVS16. 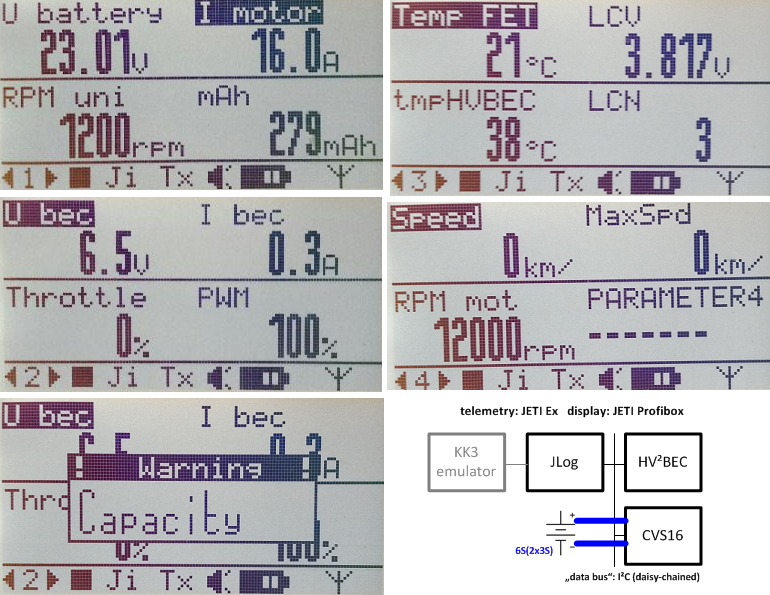 Study the manual of the ESC, – in case of a 200A HV found here or there. Download the setup software and the latest firmware (example: 200A version) for your ESC, – flash and configure the ESC. Now connect JLog to the ESC (see above) and download the appropriate firmware for your JLog: JLog2.6, JLog2.5, JLog2. Each firmware is a pair of type of ESC and telemetry. Flashing of JLog: Follow the instructions in Start. Download and install the latest JLog configurator JLC, at least JLC 7.0.2.0. JLC is based on MS .NET, so runs under Windows only! If you have a Mac – use Boot Camp or run Windows as virtual machine. – Configure JLog. It is best practice to load the config file (CONFIG.txt) which JLog created on the SD in JLC for modification – than to create a config from scratch in JLC. Regarding your type of telemetry, configurator JLC, logging and log viewing, JLog-own sensors, further wiring etc etc consult the relevant chapters of the Online Manual – and enjoy Google Translator and the German language. Standard with all other ESCs is that JLog monitors the existence of the data stream, if it fails, after a timeout period (1 second w/ KK3), clears all live data items and alarm conditions but keeps min/max values and mAh. If the data stream recovers JLog performs a warm start: clears stored data (min/max, mAh) and continues to update live data items. The assumption behind that is: ESC have been restarted by exchanging flight pack – whereas JLog kept running on a supply voltage different from the output of a built-in BEC. There is no “warm start” by JLog w/ this ESC. Stored values as min/max, alarm conditions and mAh are never cleared at runtime, only by re-powering JLog (reset/restart). If the ESC disappears (its data stream – by throttle on “zero”) accumulated mAh, Ubat and tFET are maintained, the latter two go on hold for the data direction telemetry. This avoids false alarms, at least false Ubat alarm. It also avoids that mAh are reset after an auro or any other reason for throttle on zero, if afterwards throttle goes above zero again (data stream recovering). 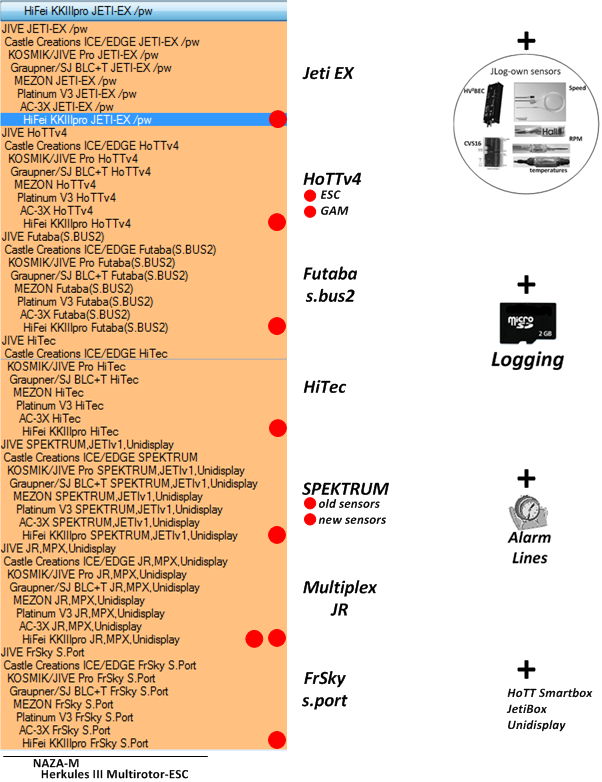 During a period of throttle==zero (no data stream) a capacity alarm is kept up - and, as usual, “capalarmstop” performed (pulsed output change by JLog) to telemetry systems which do not accept alarms by sensors (JLog): JR, Futaba. All other types of alarm sent by JLog, as well as capalarm to the other 6 telemetry systems, are temporarily cleared during the “off-period”, logged but not brought into telemetry. With “LogStop” enabled (–>JLC) a log will not show the gaps in Imot, PWM, rpm and power because failing of the data stream immediately stops log recording as well. You will notice such a gap only in the course of time stamps. Only in integrated values, ImotInt and PowerInt, off/on is recognizable because the integrator “slowly” discharges and charges again if data continues to update (functions as an RC element, capacitor charged/discharged through a resistor). Without LogStop a log will show the gaps, periods of Imot/PWM/rpm/power on zero – because log recording does not stop during that time. Integrated values will here also show this discharge/charge effect in curves. Ubat and tFET gone on hold “artificially”, – no gaps, also not in the log.
. I have my doubts that the current measurement is sufficient for an accurate accumulation of the mAh..
. Resolution is 1.0A, minimum value above zero is 3A. With LogStop: Recording gaps by no data (if throttle/pwm ==0) not to be seen, only noticeable by course of time stamps. LogStop is off: Recording gaps to be seen. Ubat and tFET maintained (on hold), as well as mAh, of course. Liebe deutschsprachige Leser! Es ist mal umgekehrt, was die Sprache dieses Abschnitts des Handbuchs betrifft, – schließlich ist es eine Amerikanische Initiative. – Ich denke, Ihr kommt klar.